Wow, what a phenomenal 50th anniversary meeting in Minneapolis. Kudos to John Dormans, MD, the 50th Anniversary Task Force led by Behrooz Akbarnia, MD, the Education Committee led by Sigurd Berven, MD, the Program Committee led by Ronald Lehman, Jr., MD, the local hosts Joseph and Sherry Perra, Tressa and the SRS staff and all who participated. We had over 1800 registrants, the historical museum was spectacular and the annual program continues to be the best spine deformity program in the world. So what is next? We just completed the Cabinet Meeting in Chicago with Board members, committee chairs and some invited guests from Hong Kong, Europe and throughout North America. The energy and enthusiasm of the members of this Society continues to set us apart. This year Steve Glassman, MD and Frank Schwab, MD are leading the Directed Research Task Force effort on risk stratification. Many great ideas are coming from members around the globe. This will be a multi-faceted, multi-year effort that we hope will help us better inform our patients and help us as surgeons make better patient specific decisions. We are financially sound. Thank you to all of our members who pay dues, to those of you who have made philanthropic gifts and to our industry partners. I am personally honored to serve you as your president. I promise you, I will do my best to serve the best interests of our Society. I am looking forward to the first U.S. based IMAST meeting in Washington, D.C. Dr. Lehman and Henry Halm, MD will make it a great meeting. Flight connections around the world should be reasonable. Tressa and I have done a site visit to Prague, Czech Republic for our upcoming Annual Meeting & Course, and it is spectacularly beautiful. As always, I expect that the content will continue to be the best in the world and is truly the highlight of our Society’s activities. In the meantime, SRS continues to support research and safety through our grants, leadership, directed research and M&M data collection and education through Worldwide Courses, Hands-On Courses, scholarships and fellowships for young surgeons and patient education materials. Committees are active with numerous projects related to the SRS mission. Please be involved. I will see you soon somewhere in the world! Virginie Lafage, PhD recently joined Hospital for Special Surgery (HSS) as Director of Spine Research under Dr. Frank Schwab, has been appointed Spine Service Chief. Dr. Lafage received her PhD in biomechanics from ENSAM in Paris, France. Before her appointment at HSS, she was Director of Spine Research at NYU Hospital for Joint Diseases. Dr. Lafage has been a member of SRS since 2010 and is currently on the 3D Scoliosis and Adult Deformity Committees. She received the SRS Goldstein Clinical Science Award, Best Clinical Poster, at the 2014 Annual Meeting & Course. Dr. Lafage’s training developed into an interest in biomechanics of the spine. Extensive expertise and leadership skills have positioned Dr. Lafage as a leader in complex orthopaedics and spine surgery research. At HSS, Dr. Lafage leads Spine Research, a group of 22. According to Dr. Lafage, you need both young talent and a diverse team (clinical backgrounds plus engineers) to have a successful Spine lab. What differentiates her research team from other Spine labs is that they stay in very close contact with the physicians. Historically, there is a gap between research and clinical where researchers gather information but it doesn’t get back to the physicians. Dr. Lafage and her team aim to close that gap and work hand-in-hand with physicians, to improve quality of care in real time. When Ross Nicholson passed away in Auckland on July 13, 2013, New Zealand Orthopaedics lost a true leader, a "Giant" with an outstanding influence over 50 years. He was educated at Auckland Grammar School, then at the University of Otago Medical School, graduating in 1947. His Orthopaedic training was in Auckland and London at the Royal National Orthopaedic Hospital under Professor Sir Herbert Seddon. On his return to New Zealand, he became a Consultant Orthopaedic Surgeon at Middlemore Hospital from 1957 to 1987. Just prior to that he was the first New Zealand ABC Fellow in 1956. Developed the first Scoliosis Unit in New Zealand at Middlemore Hospital. With the late John Morris, pioneered the introduction of the Charnley Total Hip Replacement to New Zealand. Developed the establishment of the Otara Spinal Unit for patients with severe spinal injuries. Developed the Orthopaedic Academic Unit in the Department of Surgery at the University of Auckland. Was an inaugural member of the Education Committee of the New Zealand Orthopaedic Association and, as such, developed the Orthopaedic Training Program in its current form. Established the Sir William Stephenson Personal Chair in Orthopaedic Surgery occupied by Professor Harley Gray in 1975. As would be expected of a person with his energy, ability and commitment, he held every Office in the New Zealand Orthopaedic Association culminating in his being the 17th President from 1982 - 1983. He received every major award in the New Zealand Orthopaedic Association and the Royal Australasian College of Surgeons, including the Louis Barnett and Gillies Medals, and was a Wolfson Travelling Fellow. His invitations as Visiting Professor and Guest Speaker were numerous and, as such, he was the face of New Zealand Orthopaedic Surgery in many prestigious units in North America and the British Commonwealth. The contacts he made were subsequently invaluable for the training of young New Zealand Orthopaedic Surgeons in other parts of the world (myself included). He had many other interests and held prestigious positions in the Auckland Rugby Union, was a life member of the Auckland Racing Club and the Barbarians Rugby Club, a Northern Club Trustee and President. In addition he was Chairman, Trustee and Committee Member of many other organizations. He set very high standards for himself and for others but was always fair and encouraging. He was a man of great integrity, drive, high intellect and warmth. He was indeed unique in his lifetime devotion to Orthopaedic Surgery and with his ability to embrace new technology, retained an interest and influence right up to near the end. He has left as his legacy the annual Ross Nicholson Lectureship of the Auckland Orthopaedic Society. At his funeral the Society sent a message stating that "A mighty Kauri tree has fallen". Fortunately the tree has left many flourishing young seedlings to take its place. We salute a truly great man, Oliver Ross Nicholson. In October, our Society had the privilege to celebrate its 50th Anniversary of the Annual Meeting & Course in Minneapolis, Minnesota, the city of our founding. It was wonderful to see all of you who were able to make it to the meeting and take part. To those of you who weren’t able to make it, your presence was truly missed. We had the honor of having three of our nine surviving Founding Fellows and 30 of our Past Presidents in attendance. There were many ways in which the 50th Anniversary was celebrated during the meeting including a museum, Living Legends presentations and a video that was orchestrated by the 50th Anniversary Task Force and Historical Committee. The museum was the largest undertaking of this celebration. Countless hours were spent on the researching, designing and organizing of the museum. While we were not able to include all suggestions, a very good overview of the last 50 years was given. Within the museum, daily Living Legends presentations were given. Meeting attendees had the opportunity to listen and ask questions to John E. Lonstein, MD; Jean Dubousset, MD; Se-Il Suk, MD; Jesse H. Dickson, MD; Donald P.K. Chan, MD; Marc A. Asher, MD; Kiyoshi Kaneda, MD; John P. Kostuik, MD and Nobumasa Suzuki, MD. This was an opportunity that many took advantage of and for those of you who missed out, the videos of these sessions will be posted to the SRS Archives website in early 2016. The 50th Anniversary Video was created to celebrate the origins of our Society; where we have come since 1966 and where are we going. Please visit the meeting video archives to view this wonderful video, http://srs.gmetonline.com/ViewPresentation.aspx?subscriptionpackageid=12. I would like to thank all who were involved in the planning of this wonderful meeting for their time, dedication and passion for our Society. As your new Historian, I will be working with the Historical Committee to continue to preserve our rich history. There are a few major projects on the horizon that will help bring our history to life. The first, is a virtual tour of the museum that was created for the 50th Annual Meeting. Everyone will be able to “take a walk” through the full museum that was on display in Minneapolis. The tentative release day for this is February 1, 2016. In addition to the virtual tour, all of the items from the museum timeline will be made into a timeline on the website. This is going to be an ongoing process in which we continue to expand the number of items on the timeline. Once the timeline is posted, please send suggested additions to SRS staff liaison, Ashtin at aneuschaefer@srs.org. We will also be continuing to collect video interviews of SRS Past Presidents and other greats in the field of spine deformity. I’d also like to remind everyone about our Society’s physical archives housed at University of Kansas Medical Center. Any book, document, device or other historical artifact needs to be preserved and documented. I urge you to contribute to the Archives Endowment or donate artifacts to the Archives. Please contact Ashtin at aneuschaefer@srs.org, for any questions about the items you have and wish to donate to the archives. I also highly encourage all of our members to visit the SRS and Harrington Archives at KU, it is a fantastic opportunity to see the history of our Society up close. The Corporate Relations Committee is chaired by John Dormans, MD. The committee remains quite active communicating and meeting regularly with our corporate sponsors. The goal is to expand the list of SRS corporate sponsors and to maintain and increase their level of support. Dr. Dormans' team has been quite successful with this effort and the 2014 aggregate of SRS corporate sponsorship was $1,847,250 or 42 percent of our annual income. The Development Committee is chaired by Serena Hu, MD and is charged with maintaining and increasing financial support from the SRS membership. John Dimar, MD was the past chair of this committee and deserves a big round of applause from SRS for steering the SRS 50th Anniversary Campaign which began in 2014. This effort was quite successful generating $250,000 in member donations and over $110,000 raised by the auction which was enjoyed by all at our Annual Meeting in Minneapolis. I am confident that Dr. Hu will continue to expand the fund raising effort for SRS which is based upon the generosity of our membership who believe in our mission to improve spinal care for our patients. The Long Range Planning Committee is chaired by Dr. Dormans who also deserves thanks from SRS, not only for his work as our Past President but also for chairing two important committees listed in this report. This committee is responsible for selecting the meeting sites for our future IMAST and Annual Meetings listed respectively: 2016 Washington, D.C., USA and Prague, Czech Republic; 2017 Capetown, South Africa and Philadelphia, Pennsylvania, USA; 2018 Los Angeles, California, USA and Seoul, Korea. The committee is reviewing meeting sites for 2019 and 2020 which will be announced in the future. The Finance Committee is chaired by myself and is charged with monitoring the finances of SRS. The financial state of SRS is quite sound with almost $2.7 million in general assets and slightly more than $9.1 million in the total Research and Endowment funds. Half of the R/E funds are in the REO fund which is managed by Rockefeller Financial, and as of this year, the other half which has been invested through OREF will be brought back in house to SRS and managed by Vanguard. The total endowment generates after expenses approximately $300,000 which is awarded to the various SRS research projects. I look forward to chairing the Finance Council through the end of my term as Treasurer for SRS and welcome comments and suggestions from the membership. Adult Deformity: An Adult Deformity Review Paper is under revision for submission to Spine Deformity Journal. PJK remains a key topic where support and collaboration with ongoing efforts will continue. An informed consent project will examine shared decision approaches for ASD surgery. Further understanding of 2-surgeon (1 surgeon + expert assistant) surgery will be pursued and consensus developed on when this is most suitable. Growing Spine: Past charges have been completed on new website content and E-Text. Opportunities to develop further collaboration with study groups will be explored. Efforts will focus on how to develop further educational content: ICL’s on growing spine, webinars and whiteboard animation. M&M: Accuracy of data collection has been established in validation with other large database reports. A member survey revealed general ease of data entry, most done by MD’s. Data mining revealed lower mortality in high volume practices. Ongoing statistical analysis will yield more useful findings to the SRS membership. New module development includes unplanned return to OR in 90 days, will go live 2016. In an effort to increase value to members, options will be explored such as sending of report cards directly back to each member and posting bibliography on the SRS website. Non-Operative Management: The SOSORT collaboration has produced a brace classification (to be published in Scoliosis journal). An SRS/POSNA/AAP/AAOS statement on Early Detection was approved by the SRS Board of Directors and endorsed by the AAP. A proposed Half-Day Course for Annual Meeting & Course in Prague, 2016 will offer evidence based education on bracing and scoliosis-specific exercises in the setting of AIS and ASD. Research Grant Committee: The committee awarded six grants in the last cycle for a total of approximately $144,000. The Fall cycle grant quality and volume are up considerably (now over 35 submitted). A simple reporting mechanism is being developed to track what happens to grantees 1-2 years (or more) after project completion with the goal of finding out who gets published and who gets additional funding and takes things to the next level. EBM Task Force: Three papers from the Spondylolysis systematic review were completed. Solid progress on Spondylolisthesis Systematic Review has occurred with abstracts pulled by Charlie Ledonio, MD and UMinn team (1000 abstracts). The task force feels that competence within SRS is being developed to do EBM but it is done by a very small group and the impact on larger membership is unclear. The committee will now explore how identified gaps will lead to research in order to respond to need for data. 3D Scoliosis Task Force: Efforts on the 3D classification were presented at the 50th Annual Meeting Lunchtime Symposium and as a poster at the 22nd IMAST. First draft of 3D classification of adolescent idiopathic scoliosis has been completed and submitted for publication. Ongoing efforts are focusing on utilizing 3D classification in surgical planning. One project is supported by the Canadian government and a grant from OREF: Prospective Multi-center analysis on 3D factors involved in the decision to perform a selective vs. non-selective fusion in AIS”; 2012-2015. This work is complementary to the one of the SRS 3D Scoliosis Task Force and involves a few committee members. Bylaws & Policies (Dilip Sengupta, MD) – During the recent 50th Annual Meeting, the Bylaws Committee helped to facilitate revisions to our Bylaws to include the new Senior Candidate Track (see Fellowship Committee highlight below) as well as changes in the composition of the Executive Committee. At this time, the Committee is focusing on issues surrounding the use of the SRS logo in a variety of settings. Communications (John Lubicky, MD) – The main focus of this committee has been the Newsletter, which was redesigned recently to its current format. A questionnaire may be forthcoming to see how widely the newsletters are being read and to see if further changes are needed. The Committee is also hoping to make prior newsletters more easily searchable on the website and to include regular contributions from the Ethics Committee. Ethics (Kamal Ibrahim, MD, FRCS(C), MA) – Since every organization/journal requires Conflict of Interest (COI) declarations, the committee looked into the possibility that these might be centrally hosted for SRS members through the AAOS. However, after careful vetting, this was not feasible. The committee requests that any members with questions about ethical issues contact them. Fellowship (Munish Gupta, MD) -The Fellowship Committee noted that 50 percent of Candidate Members are now from outside of the US (OUS). The committee also recently introduced the Senior Candidate Track to replace the Fast Track pathway. This new track is designed to attract experienced surgeons who are chiefs of service or full professors, have 20 publications, 20 years of experience, as well as appropriate abstract submission and attendance at Annual Meeting & Course/IMAST/Worldwide Course meetings. This track enables its applicants to apply for Active Membership after two years as Candidate Members, if they have also submitted M&M reports and served appropriately on committees. In a separate effort, Associate Membership is also being reviewed as a means to include interested non-physicians (research assistants, nurses, study coordinators, etc.) in SRS activity. Globalization (Lawrence Lenke, MD) – The committee has designated four regions and corresponding Regional Liaisons – Asia-Pacific (Noriaki Kawakami, MD; Hee Kit Wong, MD), Europe (David Marks, FRCS; Francisco Sanchez Perez-Grueso, MD), Latin America (Carlos Tello, MD; Osmar Avanzi, MD), and Africa/Middle East (Oheneba Boachie Adjei, MD; Robert Dunn, FRCS(SA)). In addition, a designated formula was used to select 62 members who have accepted invitations to become Country Representatives. Specific tasks have been assigned to the Regional Liaisons and to the Country Representatives to identify and mentor new members and to assist in various aspects of regional activity. Health Policy (Gary Brock, MD)- The committee is working on getting more states and countries on board to upgrade patient education through Scoliosis Awareness Month. This will hopefully include media events. The committee is also trying to coordinate the multi-society (SRS, AAOS, POSNA, AAP) effort to reverse a USPTF decision against school screening and to also increase SRS presence at Capitol Hill Leadership Days. Historical (Behrooz Akbarnia, MD) – Having had a series of fabulous exhibits and presentations at the 50th Annual Meeting in Minneapolis, the committee is now working on several long term projects including a web-based virtual museum and SRS timeline, as well as developing a collecting of artifacts (mostly paper documents). In addition, the committee is trying to interview as many SRS Past Presidents as possible. The Scoliosis Research Society Board of Directors and committee chairs recently met in Chicago on November 6, 2015. As the incoming Education Council Chair, I had the great privilege of meeting with the current committee chairs who will be leading their committees in planning the various educational activities for the upcoming year. They are an impressive group of talented physicians who have all made the commitment to lead their committees over the upcoming year with great diligence. We had a very productive session as we addressed the charges of each committees and I am pleased to provide the following updates. 1. The Awards & Scholarships Committee, chaired by Ian J. Harding, B.A., FRCS (Orth), will be initiating work on selecting next year’s international Traveling Fellows, soliciting candidates for the new Medtronic Research Fellowship along with choosing numerous awards to be given out at the Annual Meeting & Course and IMAST. 2. The CME Committee chaired by Lawrence Haber, MD and the SRS staff have successfully navigated the difficult and time consuming task of acquiring CME accreditation that will be up for review in two years. They have refined the product presentation in meetings and will soon be adding CME to all SRS activities including to the Spine Deformity journal. 3. The Education Committee, chaired by Theodore Choma, MD is coming off of the successful 50th Anniversary meeting in Minneapolis and will start planning the 2016 Annual Meeting in beautiful Prague. The committee plans to address risk stratification in the curriculum. 4. The E-Text Committee, chaired by John France, MD is currently reviewing 14 chapters and will continue to do so on a rolling schedule, reorganize the table of contents and add four to five new chapters. 5.The Global Outreach Committee, Chaired by Dr. Ferran Pellise Urquiza, plan to work on a clear GOP Road Map by establishing three or four site categories of recognition, establishing clear criteria for having GOP centers, and evaluating the feasibility of setting up SRS compatible GOP databases. 6. The IMAST Committee, co-chaired by Ronald Lehman, Jr., MD & Henry Halm, MD is starting work on next year’s meeting and encourages all members to submit papers for presentation in the traditional four-minute format and the two-minute format. Additional initiatives include soliciting regulatory government faculty for a special course in Washington, D.C.
7. The Patient Education Committee, chaired by Jonathan Phillips, MD will soon be releasing a new EOS patient brochure and will commence work on one for Sagittal Balance & Kyphosis brochure for pediatric and adult patients. 8. The Program Committee, chaired by Justin Smith, MD, PhD will be actively soliciting and reviewing papers for presentation at the Annual Meeting and initiate discussion on improving the poster experience. 9. The Safety & Value Committee, chaired by Suken Shah, MD will be addressing Risk Stratification issues with the Task Force and continue to evaluate methods to improve patient safety both in the US and internationally. 10. The Translation Committee, chaired by Munish Gupta, MD has now successfully translated the website into 12 languages and will be re-translating certain areas of the new website. SRS plans to recognize the people who did the translation by citing their names on the translated sites homepage. 11. The Website Committee, chaired by Ron El-Hawary, MD has worked diligently over the past year to revamp the website and the process continues as the various files are merged into the HTML format, add new videos and create webinars. The Board plans to commit recurring funds to ensure that website remains up to date. 12. The Worldwide Course Committee, chaired by Marinus de Kleuver, MD, PhD has had an amazingly successful year sponsoring courses worldwide by partnering with other societies to extend the SRS’s spinal deformity expertise globally. It has been an extremely busy start to the upcoming year and it is a very exciting time for the Scoliosis Research Society. Congratulations to all of the new chairs and a heartfelt thank you to all of the outgoing chairs for your superb work. As always, a warm thanks going out to our outstanding staff at the SRS office for making all of this possible. The SRS Fellowship Committee had a busy and successful year so far. We have recommended 24 new Candidate Fellows to the Board of Directors; 14 of them outside of the United States (OUS). Six of the 15 candidate members who were approved as Active Fellows of SRS are from OUS. These numbers reflect SRS efforts toward globalization within all aspects of our Society. We also recommended two Fast Track Candidate for Active Membership the Board. Attended at least two Annual Meetings within five years of application submission date (one meeting must be the Annual Meeting & Course and the other meeting can be the IMAST or an SRS Worldwide Course). Once all of the above requirements are met then the applicant may request a Senior Candidate Track application from the SRS office. If all applicant requirements are met and approved by the Fellowship Committee and the Board of Directors, the applicant will become a Senior Candidate Member with a two-year term working toward Active Fellowship. The candidate then enters a two year candidacy in which he/she has to attend the Annual Meetings, submit M&M, submit abstracts to the meetings and participate in the committees. The main differences between Fast Track and Senior Candidate Track is the 20 years of experience, rather than 15, no case list submission, the requirement of research productivity and a two-year candidacy rather than immediate admission. After the Membership Information Session at the 50th Annual Meeting, we received a high number of applications. The majority of these, OUS. Future goals of the Fellowship Committee include continued efforts to support globalization by having more membership informational sessions at Worldwide Courses and the development of an online application process which is expected to start running in the beginning of 2016. 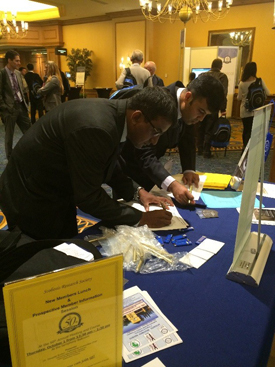 Two spine surgeons from India filling out membership applications at the 50th Annual Meeting & Course. The Worldwide Course Committee (WWC) is proud to co-organize six conferences in 2016, each time in conjunction with a national or regional spine society. These conferences, from an integral part of the SRS educational efforts across the globe, are a sign of our commitment to foster optimal care for spinal deformity patients globally. Hong Kong: On October 28-30, 2016, SRS will also be organising a Hands-On Tissue Training Course (cadaver course) with the Asia Pacific Spine Society. Our committee is working hard to disseminate the knowledge of spinal deformity all around the world and we are hoping to develop new projects and improve our global educational activities for our Society’s mission to foster optimal care for spinal deformity patients globally. We welcome applications for Worldwide Courses in 2017 from all SRS members. The Education Committee is responsible for the educational programs (Pre-Meeting Course, Half-Day Courses, and Lunchtime Symposia) at the Annual Meeting. Their efforts at the recent 50th Annual Meeting in Minneapolis are worthy of our thanks and congratulations. Under the direction of the previous Education Committee Chair, Sigurd Berven, MD, we were treated to an array of rich educational programs infused with a strong historical prospective over the arc of our Society’s first 50 years. These educational programs were exceptionally well attended and received, and the presenters and organizers have our heartfelt appreciation for all their hard work. I am personally humbled, as I know I have big shoes to try and fill. Looking ahead to the 51st Annual Meeting in Prague, we are quite thankful for Martin Repko, MD, PhD our local host. The Education Committee is currently soliciting potential educational topics for our courses and symposia from the membership. The application for educational activities is available on the Members Only section of the website (http://www.srs.org/index.php?url=members) under the “Applications” section and are due to ckissinger@srs.org on January 11, 2016. We would appreciate as much input as we can get from you, our members. Some themes currently under consideration for the Prague educational offerings are: risk stratification, safety, and evidence based medicine topics. The Educational Committee is also responsible for interfacing with other organizations such as AAOS, FOSA, NASS, and the CNS-AANS Joint Section for co-branded offerings. We urge our members to consider submitting proposals to those groups covering spine deformity topics. For those who are so inclined, please let me know as well so that SRS has an opportunity to weigh in with these groups as we seek opportunities to co-brand and enlarge to community that is afforded opportunity to learn about the management of spinal deformity conditions. I wish to extend a personal thank you to Sigurd Berven, MD for his leadership of this committee, as well as to Courtney Kissinger – our Senior Education Manager- for all of her hard work and guidance as we seek to continue the legacy of educational excellence of this Society. The Awards and Scholarships Committee is pleased to announce the winners of the 2016 Traveling Fellows. This year the committee received 18 applicants from 13 countries wishing to join Professor Keith K.D. Luk, MD, the Senior Traveling Fellow, on a tour across North America visiting active SRS member institutions. Please join us in congratulating the fellows and wishing them well during their travels in 2016. As we look to the New Year, we also are in need of volunteer host sites for a number of our other awards. By volunteering to host a fellowship winner, you are providing an invaluable opportunity and strengthening the Society’s commitment to education in the field of spinal deformity. The applications for the awards listed above as well as the Lifetime Achievement Award, Walter P. Blount Humanitarian Award, Global Outreach (GOP) Educational Scholarship, and OrthoPediatrics SRS Annual Meeting/IMAST Scholarship for Residents and Fellows opens January 1, 2016. The Ethics and Professionalism committee decided to republish the following article below because of its value in the current healthcare environment. It was written by James Roach, MD when he chaired the committee and published in the newsletter of March 2014. The committee believes this article is important to present to the membership as a part of its educational responsibilities. The committee would like to get feedback from the entire membership about the ethical issues which they see as important to discuss, therefore the committee will formulate a survey which will be sent to all members in the near future. 1. The principle of non-maleficence – this requires the surgeon to avoid harming the patient. 2. The principle of justice – the treatment rendered must be fair to the patient and or society from the stand point of benefits, risks and costs. 3. The principle of respect for autonomy – this necessitates that the physician respect the patient as an individual, who, when given adequate information, can provide make informed choices regarding treatment. 4. The principle of beneficence – when possible the surgeon has a responsibility to help the patient. What do we ethically owe our patients and what do we ethically owe to society as a whole? Do these responsibilities conflict? Is consideration of cost in the delivery of spine care ethical or do we "owe" all patients all things regardless of the burden on society? Physicians typically believe they have the moral requirement to advocate helpful treatments for their patients. However, this requirement assumes the advocated treatment is believed to be more likely to help rather than hurt the patient. To be confident that the possible benefit outweighs potential harm, the probability of both outcomes must be known to every reasonable extent. At the same time society increasingly believes physicians have an obligation to provide cost effective medicine, if possible recommending treatments that accomplish equal outcomes at the lowest cost. In many instances the obligation to the patient and to society are not in opposition but occasionally they can be, especially when the treatment is expensive and not fully established as beneficial, or perhaps for an individual patient when the potential harm may outweigh the benefit. However creating such a list of useful medical interventions is very difficult. Over 20 years ago, Oregon instituted the Oregon Health Services Commission (OHSC) and charged them with developing a ranking of medical services to fund as many high priority treatments as possible. The ranking attempted to weigh quality of well-being after treatment and cost-effectiveness. Over the years the list has required multiple revisions and has struggled to be just and equally applicable and in spite of the best efforts, the plan has not produced an economic benefit as it has experienced multiple budget shortfalls. Inevitably physicians will be challenged when patients demand a new but expensive and relatively unproven treatment or if the patient requests a workup which includes unnecessary advanced testing. If the physician declines to provide the treatment or testing, the patient will likely conclude it was only because of the cost. This necessitates that the surgeon spends sufficient time explaining that outcomes of less expensive treatments can be equivalent or even better than more expensive treatments. Many spine surgeons would consider the following as examples of the above: the use of general pool blood rather than autologous blood donation, the use of a traditional TLSO brace instead of a brace that costs two or three times more, and limiting advanced image testing in low back pain cases when it is unlikely to further refine the diagnosis. In addition to the above, spine surgeons can easily find themselves opposed to a family who is seeking a spinal fusion for a severely involved neuromuscular patient who does not have a favorable risk to benefit ratio. Thus while physicians do have increasing pressure from society to practice cost effective medicine, unfortunately much of the definition regarding “effective” remains elusive. We must work to continue to provide what we feel is the best for our patients while resisting expensive treatments when an equally beneficial alternative exists. We must continue providing prudent and appropriately indicated diagnostic workups for our patients and to recommend spinal fusions for the severely involved neuromuscular patients only when we believe the benefit to the individual outweighs the risk of harm and not just because the family demands it. In addition, individual spine surgeons have an obligation probably to society and certainly to their patients to better elucidate the expected outcomes for the treatment of spinal conditions. Perhaps establishing spinal surgery registries that can store outcomes data would assist in assessing the risks and benefits of various interventions as well as their cost. In conclusion, we are directed by the moral principle of justice to ensure the treatment rendered is fair to the patient and society from the stand point of benefits, risks and costs. Over the past year, the Non-Operative Management Committee in coordination with the Presidential Line, the SRS Health Policy Committee, AAOS, POSNA and the AAP, developed and delivered a consensus statement to the United States Preventive Services Task Force (USPSTF) urging them to reconsider the current “D” recommendation for school screening for adolescent idiopathic scoliosis. A change of emphasis was also encouraged, away from school screening and toward early detection of scoliosis. At this time, the USPSTF has decided to revisit this recommendation and will issue an updated recommendation in 2017. In the coming year, the committee will continue its work on evaluating Scoliosis Specific Exercises (SSEs) and is in the process of developing a Half-Day Course for the 2016 Annual Meeting & Course exploring this topic more thoroughly. The emphasis will be on the current scientific basis and support for this modality, as well as how best to deliver and manage it in practice along with the appropriate use of bracing. The course will explore how SSEs may be considered for early-onset, adolescent and adult scoliosis patients. Also this year, the committee will survey the membership on current non-operative management of scoliosis patients, including adult patients. The emphasis here will be on evaluating the use of bracing, in light of the publication of the BrAIST study findings, the use of brace monitoring and the prescription of SSEs. When the survey arrives, please take the time to fill it out!